Stronger. Lighter. Faster. Tough as hell. Stronger. Lighter. Faster. Nothing epitomizes our slogan more than our rims. This year we are introducing the SupreliteSL. The Suprelite SL rims are a tubeless, ultra lightweight 25mm wide all-mountain/XC rim. Stronger. Lighter. Faster. Nothing epitomizes our slogan more than our rims. Stronger. Lighter. Faster. Nothing epitomizes our slogan more than our rims. The Pimp2/DHR is 34mm wide with loads of strength. Construction to reduce the flat spot/dent problems of the original Trailpimps, but they’ve still got a largely indestructible reputation on the trails. Solar 30 is the new very light and strong model. It will do the job perfectly as a front & rear rim, however it’s recommended for smooth riders. New custom designed rims translates into good looking and strong structure. Low and wide profile give a good look and stiff construction. Reinforced for maximum strength in crucial areas. Available in both 26 and 24 inch sizes. Very light and strong quality rims. Heat-treated 6061 aluminium and great low & light double-wall profile. Single eyeleted. Only for use with disk brakes. Available both in 26” and 24” sizes, 32h and 36h versions and several finishes. A great rim for all mountain, heavy duty trail use as well as slalom, mountain cross, or Super-D events. The result of blending a ZTR Race rim with a ZTR 355, the ZTR Crest is the best of both worlds. All the wall thickness and corresponding durability of a 355 with the next generation BST creating a wider rim cavity with shorter sidewalls. Fully tubeless compatible with the 21mm yellow tape or the 25mm yellow tape and valve stem. Ultra lightweight Cross-Country Race disc rim. The Sun Ringle Equalizer 21 rim offers a great connection between the trail and your bike. 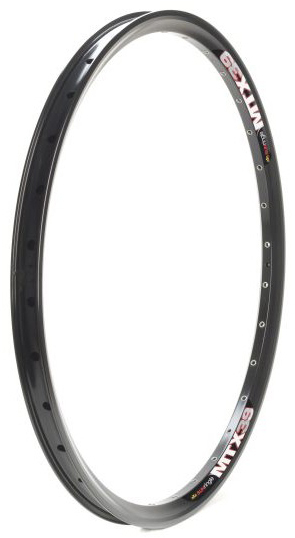 At about 335 grams, 26″, this rim is light and perfect for XC riding/racing. This Equalizer Rims are strong and sturdy rims that are ideal for anyone who is looking to build a XC wheelset that will only be disc brake compatible. The SunRingle EQ Rim is a disc specific XC/All Mountain rim. Reinforced spokeface with eyelets, the SunRingle EQ Rim is constructed with a single-pocket aluminum with a welded seam. Tough enough for aggressive aggresive all mountain riding but light enough for XC racing. Sun EQ27 Equalizer Rims are strong and smooth rims that intended for all mountain riders. At 29mm wide this rim is perfect a perfect match for high volume tires used on today’s light weight long travel all mountain bikes. The width allow the volume of air inside the tire to be larger, providing a very supple and very stable feel. Available in two colors, black and white, to match your style. Sun EQ31 26″, Equalizer Rims are strong and durable rims that is a great choice for anyone who likes to ride hard. The SunRingle MTX Rim is a disc specific freeride rim. Reinforced spokeface with eyelets, the SunRingle MTX Rim is constructed with a single-pocket aluminum with a welded seam. Tough enough for aggressive freeriding and DH riding. Hi, so sorry but Pimplite Blue rims not available. Oh.. what about the same setup but with blue ztr rims? Do you carry in alexrims in white? Do you have ZTR Crest 27.5 in stock ? and how much for a pair ? Hi, do call us to confirm on availability. Price at $210 a pair. Do you have ZTR Arch Ex in 27.5″? Hi, yes we do, Price at $210 a pair. hi sir… how much does MTX33 camo cost? Hi, sorry they are all sold out. Hi, do you have Sun ringel MTX33 or the Mavic EX729 (both 26″, 36 holes how much would it cost me to ship them to Canada. Hi, so sorry but we do not have both in stock for now. You have ZTR Arch in 29″? Hello, are you selling atomlab pimplite rims or the wheelset? Hi, they are available only in rims.